Note : Live CD and DVD (sold separately) from an epic night of music recorded at the Fox Theatre in Boulder, Colorado on May 19, 2006. The DVD is 97 minutes of performance and interviews, directed by Justin Kreutzmann. "Got a little bit of soul / Got a little bit of rock n'‚ roll in my bones." Thus opens Taught to be Proud, the new studio album from San Francisco‚s bustling Tea Leaf Green, a band of youthful gypsies with an abundance of both rock & soul. You can feel it in their hair-raising live performances and you can hear it in the headlong rush of their latest release. 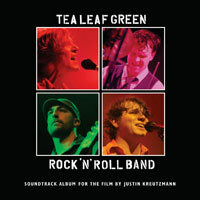 Conjuring the spirit of 1970s Bob Dylan, The Faces, and early Elton John, Tea Leaf Green takes classic sounds and reminds us exactly why we lifted our lighters in the air in the first place. Singer-songwriter & keyboardist Trevor Garrod says, "Everything should be energetic. We're trying to get a response all the time. We have songs that start off with a coiling energy and that‚s us trying to interact with the crowd and get them involved." The compelling reach of Tea Leaf Green grabs you in the opening seconds of their latest release, and never lets go through the course of a sonic hayride that takes us away from our troubled towns and into a brighter countryside. "Taught to be Proud makes me feel like all the past years that the band has been playing were just practice. This album is TLG's missing piece," offers Garrod. Red hot guitarist Josh Clark adds, "Taught to be Proud seems to me to have captured the more eloquent and simply stated aspects of the band. It feels, dare I say, grown up." That growth spurt hasn‚t gone unnoticed. Tea Leaf opened shows in fall 2005 for Gov't Mule & Trey Anastasio, and they spent the summer gracing stages at high profile gatherings like the Bonnaroo, Wakarusa, and High Sierra festivals. The band tours relentlessly, headlining packed houses coast to coast. Every performance carries a kind of apostolic zeal, a belief in the innate power of music to deliver truth and pleasure. Facing down the dark tide they see on the horizon with honesty & infectious vigor, TLG make you believe in a future where the world can be made better if we open our eyes and just take someone's hand. What catches your ear about TLG is how they evoke the same feeling as classic bands without mimicking their ancestors. The vibe is timeless, but how they generate it is all their own making. "The thing about Tea Leaf Green is that we never sat down and talked about what kind of band we wanted to be," Garrod explains. "We didn‚t write up a manifesto, swap art rock tapes or list endless influences on CraigsList trying to find the players. We just started playing together and it‚s always felt right." 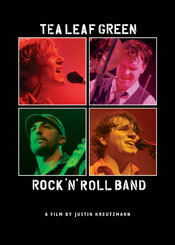 Clark jumps in, "Making Rock and Roll is an art form best performed with an understanding of its tradition." One senses open-ended possibilities with Tea Leaf Green. The sheer range contained on Taught to be Proud testifies to their grasp of reflective songcraft, breezy pop, and expansive exploration, all laid on the rock solid foundation of bassist Ben Chambers and drummer Scott Rager. There's an embracing sweep to what this band does. They are bards for dispossessed ramblers, gamblers with no bankroll, and hobos waiting for the sunrise. The postmodern flower children sway to their beat - and the late night ravers sweat their way through TLG's garden. They are hope for disenchanted blue staters - and the best dance partner beer ever had in a red state. They make us remember our hips and that smiling isn't as hard as we usually make it. And they do it all without switching off deeper thoughts. In fact, they show us the wellspring of hope waiting inside the examined life. Smart and dynamic, it's a compelling combination that speaks to a bright future for this heart-strong quartet.